Canada’s dominant leisure destination has also become the best meeting destination, says Noel Buckley, president and general manager of the Scotiabank Convention Centre. “We are the dominant leisure destination in Canada, generating more international demand than any other leisure destination in the country,” Buckley recently told Niagara Falls city council as he updated politicians on how the Stanley Avenue facility is performing. He said since opening six years ago, the centre has significantly grown in the number of event days it hosts — from 140 in 2011 to 282 in 2016. Police were probing a possible security threat at the Scotiabank Convention Centre in Niagara Falls Friday evening. A call of a man with a weapon and a bomb at the convention centre was made to U.S. police around 6:30 p.m. Friday. The U.S. authorities alerted Niagara Regional Police to the call. Police are searching the building and reviewing video surveillance to determine if there is truth to the call. This was last Friday. Nothing was found. With new tourism-related services, and the potential for more in the coming years, officials see a bright future for the No. 1 industry in Niagara Falls. As the traditional tourism season gets underway in the city, many of those involved in the sector are looking forward to seeing if, or how, the new convention centre will help an industry that has suffered some lean years recently. But with the food and wine expo at the convention centre this weekend, an extension to GO rail service, with discussions continuing on a people-mover system and with the potential for a new 7,000-seat entertainment centre bringing A-list stars to the city in a few years, the long-term prospects look good, they say. 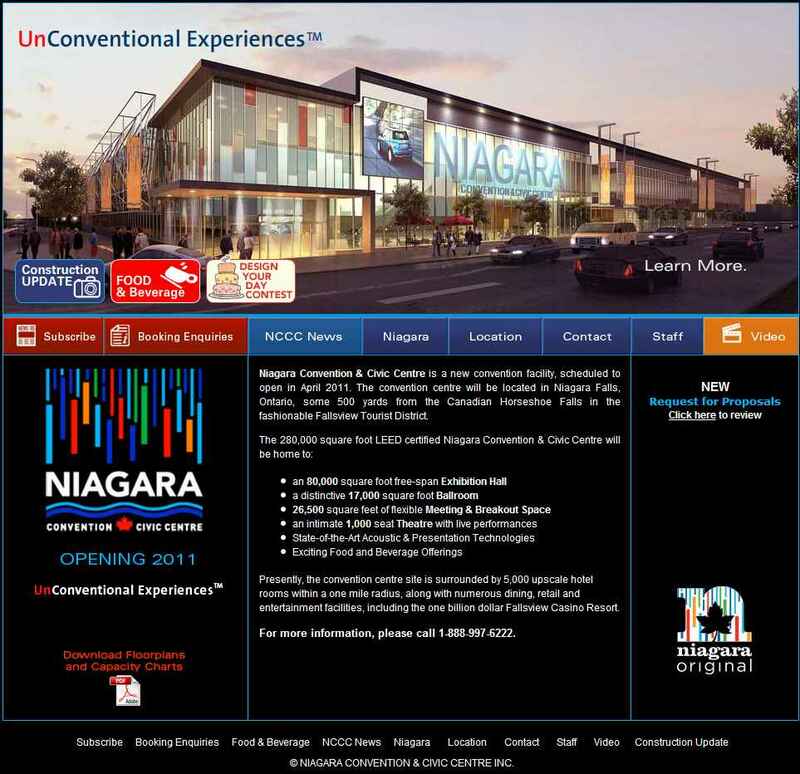 Yesterday one of my Google Alerts had a link to http://www.niagaraconventionciviccentre.com/attractions.php that mentioned Clifton Hill. I was intrigued, so I visited the link. At first glance, it appeared to be legit and I wondered why there weren’t more attractions listed. Then I noticed that all of the attractions were owned by the same company. I browsed the site, and the other restaurants and hotels were also all owned by Niagara 21st Group (or whatever that company may have split into). I generally try to avoid commentary on the site, but I have to say that I don’t like this. A major operator in the city has registered a domain that may trick people into thinking it is the real convention centre web site. I think it looks bad on them, and could actually hurt potential users of the convention centre if the site does confuse them. One year to the day that ground was broken on the $100 million Niagara Convention & Civic Centre, the project hit a major milestone. The 288,000-square-foot Stanley Avenue center, being constructed just a short walk from the Niagara Fallsview Casino in the thriving Niagara Falls, Ont., was officially “topped” off Friday afternoon under the watchful eyes of Niagara regional political and business leaders as well as a crew of construction workers who are building the facility. The center is scheduled to open in April 2011 and is viewed as major piece of Niagara Falls’ growing portfolio of hospitality and tourism-based ventures. “This changes our city forever,” said Niagara Falls Mayor Ted Salci.